While West Seattle and Ballard (and Eastside BRT!) have been getting all the media attention, Sound Transit continues to refine Tacoma Dome Link extension, a 4 station, ~10 mile connection that will complete the southern end of the light rail spine by 2030. Sound Transit has provided a wide array of options, which as always carry a similar set of tradeoffs: car access vs. bus transfers, TOD opportunities vs. business impacts, ridership vs. capital costs. Sometimes the geography presents a win-win, other times hard decisions must be made. Compared to Lynnwood and Federal Way, the I-5 vs. 99 tradeoffs are minor. South Federal Way station is the exception. Unlike in (some of!) Seattle, the walkshed around these stations is supremely car-oriented today. The goal ought to be to maximize opportunities for transit-oriented redevelopment in the station area while minimizing the number of immovable obstacles (interstate highways, bodies of water, freight tracks, etc.). Let’s have a look at the latest options, starting at the Tacoma Dome station (visualizations PDF), so as not to be so Seattle-centric in our thinking. ST finds greater advantage in a station on E 25th St (TD2 & TD3). This location provides the best multimodal access and connection to Tacoma Link, Amtrak and Sounder. TD1 has good ridership but more business impacts. 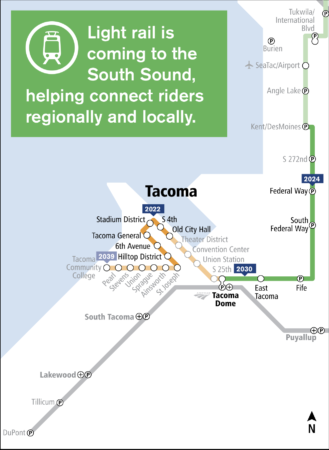 TD2 has more potential property impacts and is more expensive to build, but closer to Sounder and Tacoma Link connections. TD3 is currently constrained by zoning, but that’s fixable. TD4 would terminate the line in the Tacoma Dome parking lot. Less than a mile up the road is East Tacoma station (visualizations). Bisected by I-5, the East Tacoma station area has industrial uses on one side and single-family residential on the other. Intersecting freeways, trains and rivers makes any station choice a challenge. ST’s sole preferred option for East Tacoma (3A) comes at the highest cost but makes the best use of the walk shed for pedestrian and other non-motorized access. Heading north, the trains would stop next in Fife (visualizations), where all alternatives are on or around SR-99 (just a block from I-5). ST finds the highest potential for a station one block off Pacific Highway on 15th Street E (3A/3B). There are some conflicts with “view-dependent businesses” for the I-5 alignment and higher costs for routing via 99. Finally, we arrive in South Federal Way (visualizations), a suburban area with mostly car-oriented businesses but lots of potential for TOD. Here we see the classic I-5 vs. SR-99 battle most clearly. I-5 (SF8/9) would emphasize car access to the station, while a station on SR-99 (SF4) would have the most development potential (but with higher costs and impacts to existing businesses). SF2 splits the difference and puts the station on Enchanted Parkway. You can comment online between now and May 1. No visualization for South Federal Way? If they wanted to do a South Federal Way station worth doing, they would run it to the existing S. Federal Way park and ride (also in good proximity to Saint Francis Hospital), probably by using cheap ROW around Celebration Park to get to 9th Ave S. But at least they seem to know better than to put the station at the far east end of the Home Depot parking lot. “existing S. Federal Way park and ride” – that’s basically the SF4 alignment, where the P&R garage is in the same spot as the existing P&R, correct? Is there a link to a hi-res version of the colorful route map pictured? You can click on the image or go to the Sound Transit site. Sound Transit will, once again, choose I-5 to minimize the challenging work and take the route of least political resistance today instead of choosing to take the harder path to build a great line for the next century. They had an incredible opportunity to continue Link down SR99 from Angle Lake, making the most of the slow SR518 jog, and missed an opportunity to turn this line into an extension of Tacoma itself rather than just a long train to Seattle. I see that only two remaining station alternatives (out of six) in South Federal Way and one remaining station alternative (out of five) in East Tacoma are adjacent to I-5. All Fife stations are now north of 99. Tacoma Dome Stations are away from I-5. If anything, ST appears to be preferring alternatives for stations away from I-5 more. Miles of the tracks may end up along I-5 — but except for infill station dreaming — I doubt that future Link riders care. Fife wants it on 99 for potential TOD development and tax revenue. So it’s the opposite of the Des Moines and Federal Way situations. and that large chunk of land to the north just south of 509 is under development as warehouse space for the port of Tacoma. The tribe is not going to redevelop the casino except to make it bigger. All the people who live in fife live on the south side of I-5 and which means to get to the station you would have to cross I 5 and 99 and there are no ped bides proposed. It looks to me like there are three versions of TD4, and only the third one ends up in the Tacoma Dome parking lot. The other two are located along 26th, either in-street or off-street. My favorite of all of the Tacoma Dome options is TD1, along Puyallup Avenue, because it has the easiest connection to buses. TD2 (on 25th) would be nice, but that looks really difficult to construct, squeezed between Freighthouse Square and the garage, and above Tacoma Link. Correct! There are several iterations of TD4. TD4 East In Street is actually the version that I find most interesting because it allows pedestrian infrastructure to overcome barriers created by super blocks and rail lines. More TOD seems like it would be possible nearby TD4 as well. I think TD2 can work, but I’d want to elevate that station pretty high above the parking garages so that passengers can get a decent view of the CBD and not be blocked by the parking garage. TD3 needs another Tacoma Link station near the maintenance facility to provide access to regional light rail at G Street. I had hoped for a level platform to get to Tacoma Link. However, I understand why both platforms are needed for Red/Green Link trains. In lieu of that, TD2 comes the closest to connecting the two light rail lines. It unfornately comes with a two level mezzanine. I wonder if the Tacoma Link tracks could be elevated up to the mezzanine. Kudos to ST for comprehensive visualizations of each station! Kudos to for showing circles rather than bars for station locations! The only soft complaint is that the buildings block details in the Tacoma Dome area. Otherwise, the diagrams are great — even showing track shadows change where tracks are more elevated. This sets a new standard for all studies. The public should be able to comment more readily with visualizations like this. Given how West Seattle / Ballard doesn’t have public visualizations for every station, I would like to see these developed and that comment period reopened for that work. I totally agree. This should be the standard for presenting routing/station alternatives for all light rail projects currently in development. Off topic, but I’m just curious why the Tacoma Link has such a circuitous route, when instead of connecting the southern edge from St Joseph to Union or 25th so that all three fingers of it can run direct to the transit hub. Have you ever seen Tacoma, even just from I5 heading South? Tacoma is basically a plateau with 200′-400′ slopes/cliffs on the 3 sides bordering the water. That’s about a 12% grade (~300′ vertical over 2500′ by my guestimated map-reading) between St. Joseph and Union. I can’t speak to the engineering/budget details of the actual routing, but that probably has something to do with it. The current route goes through the downtown core and the ST2 extension (Old City Hall -> St. Jo) is essentially a switchback. The ST3 extension to TCC is relatively flat. The practical reason is that the grades from the Hilltop neighborhood down to the Tacoma Dome area are 10-18% on pretty much every east-west street in the area. Can’t run a rail down that. The proposed routing is longer, but the grade is much more gradual. It also has to do with using mid-term planning instead of long-term planning. The original segment was the Dome to the theater district. Using mid-term planning, the city decide that the next place to go was the Hilltop neighborhood, along MLK. More long-term thinking would have identified the indirectness of this routing and probably would have gone west along 6th Ave instead. Totally agree that 6th Ave would have been a superior route. 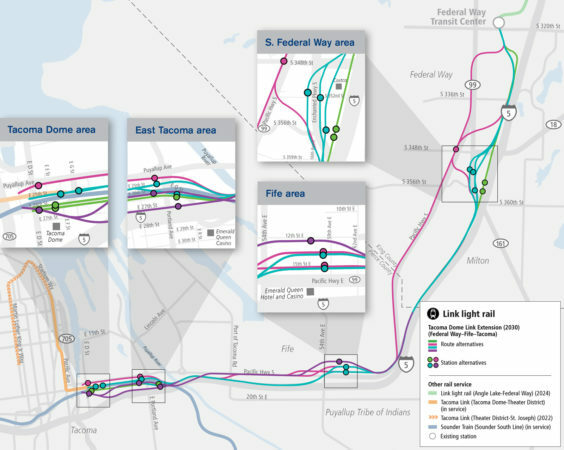 I’m not an expert on Doentown Tacoma travel patterns or topography, but it does look non-sensical to extend Tacoma Link when a connection to the Red/Green lines would be so close and fast. Lots is probably related to long-time promises to extend Tacoma Link before ST3 was finalized and passed. Because it is a streetcar (see comments one and two). On the map at the top of this blog piece, why is the section of the light rail line between Angle Lake and Kent/Des Moines shown in the shaded green color, like it’s a section already in operation? What was the source for this map? Because it’s being funded by ST2 and so, when the facilities under discussion are built, it will already have opened for service. That explanation just doesn’t cut it, since the rest of the Federal Way Link Extension project is shown in the bright green color on this map. It must just be an error on the mapmaker’s part. The part between 200th and 320th has been bouncing like a football between different project assignments throughout ST2 and 3. I don’t think it makes much difference which project it appears to be in. The important thing is that 240th, 272nd, and 320th are now scheduled to open simultaneously in 2024, and Tacoma Dome in 2030. The split in the map at KDM may either be an error or reflect some minor short-term phase of the project-assignment evolution. I suspect the mapmaker for this custom graphic for the project made a mistake or had an oversight. Graphics straight lines are usually one layer, so splitting the line into different colors would be required to have it be two layers. Since it’s not salient to this segment, I just find it amusing but not important. Mapmaker here. No, graphics of different colors are not required to be on two layers but it is good practice to have separate layers for “in operation” and “future service” lines. It’s very easy either way to make a mistake like this. Thanks for the replies. Yeah, it’s not a big deal by any means. It just jumped out at me from the start and I was wondering for a moment if perhaps I was interpreting the map incorrectly. Apparently it was just a mistake by the mapmaker. on S Federal Way, is the 99 alignment the best walkshed because of how far north it is, rather than how far west it is, b/c the walkshed ends abruptly at West Hylebos Wetlands Park? I would like to see a SF 2 East alignment that is a bit farther north so it has good ped access north of SR18. Because of Hylebos park limiting the walkshed to the west, it seems to me a station over 16th & 348th isn’t materially different than 99 & 348th in terms of supporting TOD. Disagree? The big unknown to South Federal Way is how the surrounding land uses could change. One-story, big box, low-cost buildings are very financially feasible to demolish — and the large assembled pieces of property for the stores and surrounding big parking areas make TOD developers salivate with possibility. Even crossing major arterials like 348th or Enchanted Parkway for pedestrians could be easy with developer-funded overcrossings. It boils down to zoning and design incentives by Federal Way, and how the property owners respond. If a developer proposed three new 40-story residential buildings, I’m more than happy to place it at the front door. In contrast, it would sadden me to put it by a new car dealership lot. With this in mind, perhaps the station alternatives should be cost-neutral with the differences demonstrated by conceptual grade-separated pedestrian networks. Finally, I’ll add that South Federal Way is probably the most TOD-suitable station area (along with Tacoma Dome). The views and the soils/bedrock are much better there. I’m with you on that. I think that the Enchanted Pkwy @ 352nd options are the best ones here. It’s a big fat busy shopping center right now, and the TOD potential is huge. I look at how each station option sets up the entire access system — bus routing, drop-off areas, pedestrian connections. I like the options separate buses from drop-offs (some alternatives even on different blocks), and I like the options where buses enter in one place and exit at another, rather than the “tight circle” for routing buses. The one thing that isn’t clear from the visualizations is where land can’t be developed for environmental or park reasons — and that would help inform the discussion greatly. I’d agree. I do prefer the station layouts for Alternative 4 (separate entrances for pedestrians, drop-offs, park and ride and buses not in a tight loop) that straddle a major road (for better pedestrian access) — but I’d like to see those layouts tried at the other locations, especially Alternative 2 West Enchanted / 352nd. Why is the end of the line elevated? Given the environment there with Sounder/Amtrak and T-Link at grade, running Link at grade also make sense – would make for easier transfers & fit into the built environment better. We are using technology that allows for at-grade running, this locations seem like a good place to use it. There are no major north-south roads to block. Also, ST3 funds design for extending to Tacoma Mall … the visuals suggest the want to launch the line over 705 … why not just go under 705, just like T-link. I am sad that there isn’t a more deliberate effort to revisit the Tacoma Dome Station in its entirety — and instead just make Link additive. It could really be a magical, exciting destination! For example, picture another giant signature glass dome covering a mixed-use complex with great connectivity to all the transit there. After dusk, the new dome could feature a light show! Just look how revisiting the Transbay Terminal in SF resulted in a new 1000-foot tower and rooftop park. To do this would require a joint powers consortium of agencies to work together to put out a call for development concepts. Is that even possible? Im sad that the alignment of the station is set up for ST’s predetermined next extension to the South Tacoma Mall and not downtown Tacoma. I suppose it’s par for the course that ST would favor an alignment down the highway to big brownfield station sites prime for redevelopment over established dense urban neighborhoods, but it surprises me that there isn’t a little more pressure from downtown Tacoma interests. As someone who periodically works out of an office in downtown tacoma, it’s dissappointing that the streetcar transfer and slow ride into downtown is considered acceptable long term. The alignment of the station allows for either a future station where it crosses Pacific Avenue or a Brewery District station, IIRC. Pacific Avenue BRT is also planned to link to Tacoma dome station, which will provide a fast and frequent connection to downtown. It was the Pierce delegation that convinced ST to orient it south toward the mall. Otherwise a downtown extension might have come up, and it certainly would have if the city of Tacoma and the Pierce boardmembers had agitated for it. So you need to look in Pierce County for the push for this plan, not in ST’s central offices. That “big brownfield site” also meets one of ST’s and the Puget Sound Regional Council’s general goals: getting high-capacity transit to designated “urban centers”, defined as a place with a minimum amount of zoned job capacity.Tacoma could have done that in downtown Tacoma but chose Tacoma Mall instead. Tacoma’s fundamental geography is also unfortunate: downtown is in a dead-end penninsula, so Link would have to backtrack to get to it. That plus the early decision for Tacoma Link from the Dome to downtown as a Sounder shuttle. That did give Tacoma some rail service decades before any other city, but it also means that Central Link would duplicate Tacoma Link if it went downtown, or raise the difficult issue of whether to decomission Tacoma Link. Yes, they serve somewhat different transit markets, because Tacoma Link has more intermediate stops than Central Link would, but at the same time it would still be an overlap of two light rail services, when Seattle couldn’t get the local light-rail network it really needed. As for elevated vs surface, Link is on the surface in Kent and north Seattle/Shoreline; it’s just within freeway ROW so it can use the freeway’s overpasses and avoid level crossings. That gives you the advantages of elevated without the cost. I don’t know whether that’s feasible in Fife, or whether “elevated” really means unnecessary stanchions that would be a needless expense. That’s a good question for ST. I hadn’t thought of surface there. A major advantage in north Pierce is that both I-5 and 99 are wide and publicly-owned so there isn’t land-acquisition costs. That probably dwarfs the cost difference between surface and elevated. And both I-5 and 99 are close together there, so it doesn’t make a lot of difference between them. Whats with all these elevated alternatives ruining the property values and views around the T-Dome? TACOMA DESERVES A TUNNEL! Tunnels not only break the bank and drive up construction costs a lot (so it would take much longer for Link to reach Tacoma), but it turns out that elevated rail doesn’t hurt property values and a lot of people like seeing trains in their views. Tunnels are generally recommended only in dense areas like downtown Seattle and Northgate, so unless the Tacoma Dome area is going to become dense, it’s probably not a good idea to build a tunnel there. The money would be far better spent on funding more transit projects instead. There is a 10 floor parking garage that already blocks the view in that area. As above comments point out, building along 99 provides for a lot more potential for redevelopment of land next to stations, thus providing a lot more walk up and transit transfer ridership instead of park and ride ridership. If we had done that for Federal Way Link, we not only would have had a lot more of the above mentioned benefits, but it also provides easy ways to build infill stations. Building it along I-5 also doesn’t save that much time or money. Scrap it and END the outrages RTA tax, Refund all the money.!!!!! I think it’s “outrageous” you’re looking for there. Between the huffing and puffing that is. Taxpayers pay a lot more for a lot of roads that move a lot less people, so these taxes are far from outrageous. The ST projects selected for Pierce were done as an assembled wish list by Board members. It’s what happens when a range of ideas are already germinated to the point of advocacy. It’s like Christmas shopping for each kid’s wishes rather than buying a set of beneficial gifts to better a family. To make North King and Snohomish subarea projects findable, there were even last-minute extra allocations to Pierce to even things financially. I don’t see it as much of an indictment of ST as I do the current state of agency and municipal coordination for transit in Pierce. Pierce Transit is actually pretty scrappy and cost-conscious but their budget woes have been so severe that it keeps them from actively dreaming big. Suport Howard for Prez!!! Hes a Man of the People.!!!! The projects all come from ST’s long-range plan, which is a list of unfunded things ST thinks the subarea needs. It’s based on what the subarea’s boardmembers, cities, and community say they need. The ST board consists of elected officials from the subareas, who were elected because they supposedly know what their county, city, and neighboring cities need. If there’s a problem it’s in these officials and the people who voted for them. When an expansion phase comes up, ST selects projects from the map, again based on what the subarea delegates think are the highest priorities. Usually they don’t just go into one phase out of the blue, they go into the end of one phase for preplanning and into the next phase for construction. ST2 preplanned a half-dozen corridors for ST3. Of those, Ballard and West Seattle and 405 BRT were selected, while 45th, Burien-Renton, and 405 commuter rail were not. The Everett-Tacoma spine is rather a special case because it was Snohimish’s and Pierce’s top priority from the beginning and one of the main reasons they supported ST1 and 2, which they knew it depended on. So you can’t count Everett Station and Tacoma Dome as short-term Christmas-tree items; they were the vision that Sound Transit was predicated on. +1 I think your reply is spot on. I might add that as far as the Snohomish County subarea goes, light rail to Everett in a second phase of expansion was promised by ST in an official board motion long before the ST2 plan was finalized. Obviously, ST didn’t honor that committment as connecting the spine to Everett was pushed to ST3. Will STB and/or Seattle Subway being doing an advisory post for this section? If so, I will hold my comments to Sound Transit for such an article. Thank you! I like the route running along SR-99 from the 320th station with the new South Federal Way station being placed at 348th Street. There is a larger radius for TOD to happen away from I-5, developers would have more options. –Also there would be opportunity to infill a new station(s) when Federal Way is much more dense many years from now. Any thoughts on this? Whats the general consensus here on peoples favorite routes for FW? Of course. What you say was true between Angle Lake and downtown Federal Way as well. But it is more expensive to build elevated over SR99 and more disruptive. Also, Pierce County doesn’t care about TOD in King County, but they are the primary funder of the extension below 320th, so they kind of get to choose. They want to get to the airport as fast as possible, so they won’t like “infill stations”. I know this has been said, but SoundTransit seriously needs to think decades ahead. Instead of just running everything along i-5, where you’d mainly have to drive your car to even get to the train. I get its more expensive, but is it that much more expensive where they will actually run out of funding? But on the disruptive part, It will be worth.. it in the long run.